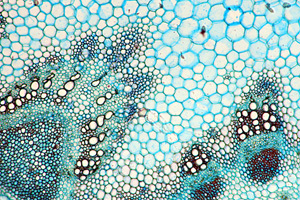 Cross section of the stem of a sunflower. Microscopes generally do not require much maintenance and should deliver many years of reliable performance if kept well. Improper use of the instruments causes the instruments to age much quicker. Course work can be quite tough on the devices and a regular functionality check prolongs the life of the instrument. Cleaning the eye pieces of fat: Fat from the eye lashed accumulates on the surface of the eye piece. Use a cleaning fluid and cleaning cloth that does not damage the optical coating of the optics. Cleaning the objectives from immersion oil: Use synthetic immersion oil only! Natural oils may solidify over time. Even if synthetic oils are used, make sure that the students clean the objectives properly after usage. Also check the non-immersion objectives for the presence of immersion oil! Occasionally students do rotate non-immersion objectives into the oil. Use a cleaning fluid that does not harm the cement that is responsible of holding the lens in place! Checking the working of the gears and cleaning the gears from hardened oil: It is not good to turn the knobs by force. This may increase the wear of the gears over time. The gears should be cleaned of solidified oil so that all of the knobs turn smoothly again. Replacing old light bulbs: Old light bulbs start to shift towards the red end of the spectrum. A blue filter (daylight filter) restores a more balanced color, it is best to replace old bulbs even if they are still functional. When replacing bulbs, do not touch the new bulb with your fingers, as the fat of your fingers will burn on the bulb and decrease the light intensity. Be careful when using cleaning fluids to clean optical surfaces. Only use those fluids that do not remove the optical coating of the glass surfaces. Use lens paper and do not rub to strongly to prevent scratching. Do not apply the cleaning fluid directly to the objective or ocular, apply it to the lens paper first. This way you prevent it from flowing into cracks where they can not be removed easily. ie- use lens hoods they prevent fat from the eyes getting on the lens. I find IPA a good spirit to use, this usually comes with denat, if bought from an optometrist. Of course, if your microscope has an anti reflective coating, then using spirits other than those recommeded by your maker is definately a bad idea. I use a classical monocular compound luck horseshoe type scope. Critics of this style, argue that they were always more difficult to use, as the movement of the stem drives the optics nearer your face. Some see this as a hazzard. In truth, this is not true, it is always necessary to wear safety glasses, before looking at your occular. There are many newer more recent, and far more complex microscopes, that REALLY are positively lethal. The biggest problem people tend to ignore, is the lamp. Often the lamp is integral to the scope, and often the lamp is mains powered. I recommend use of a microscope with a reflective mirror. An external lamp, is always a more versatile accessory than one affixed to the base, and much safer, as there is no longer a need for the microscope you put near your head, to have any part to do with mains power. If you like, you can take Mr fitt’s point and use a rubber lens hood, or make one out of a piece of suitable tube, but contact abrasion against the skin, occurs with prolonged use, especially if you neglect the use of safety glasses. These two minor points will greatly increase your experience, and ensure your personal safety.